Thinking of a career in medicine? 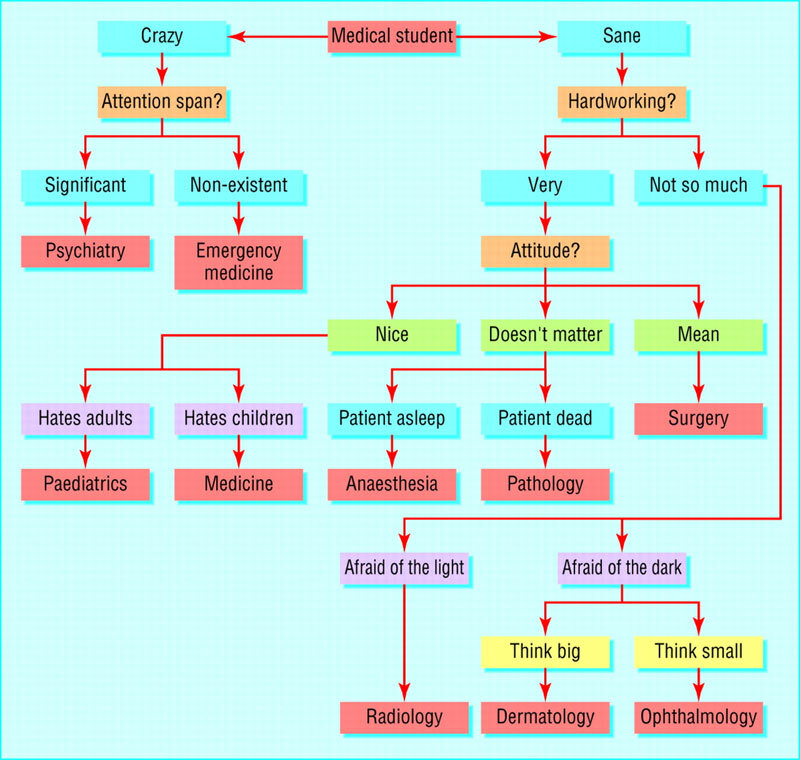 The flowchart from the British Medical Journal below pretty much sums it up. With over 70 different specialties to choose from, medicine offers something for everyone. I reckon that a career in rural and remote medicine offers all the ‘best bits’ of the various specialties and guarantees that rural doctors are seldom bored with their work. The training for this job is significantly different to that of a metro GP, hence most of us hold Fellowship of the Australian College of Rural & Remote Medicine, with ACRRM being the peak body to specialise in rural medicine. So, how do you become a rural doctor? Well, first up there’s medical school – either as a first degree from school, or entry as a mature or graduate entrant after a previous degree. Medical school lays the foundations in anatomy, biochemistry, pharmacology, physiology and several years in clinical training before being unleashed as an intern on limited registration. Following internship and gaining full registration, new doctors usually undertake several years of postgraduate residency and registrar training…a chance to rotate through various specialties and decide whether a lifetime looking up willies (urology) or operating on porridge (neurosurgery) is for you. Rural doctors gather a solid casework in medicine, surgery, paediatrics, mental health and emergency medicine…and many go on to gather significant experience and postgraduate qualifications in anaesthetics, obstetrics or surgery. All this takes time, with many spending 5-7 years of postgraduate training on top of five years at medical school. But you know what? Most of us are still learning. Blogs like this give a chance to discuss new developments of relevance to our field, and hopefully inspire others to pursue a rewarding career in rural medicine.